Jeremy is shaking his head in disbelief and he hasn’t even read my post yet! The Christmas cards are trickling in this season–it’s December 12, and I’ve received just a few–five to be exact. I received one in early November with a nice letter. The second came in late November, from Aunt Evelyn and Uncle Ken. They always do a creative write-up of their year in review. There’s a photo card from the Robinsons–including the addition of Sarah’s husband-to-be. Maybe the bulk of my cards are still in the mail. I remember the “good ole’ days” when the four kids were lined up, each with a folding snack table in front of us, signing our names in assembly-line style to the hundred or more Christmas cards my mom was sending out. Then she would write a sincere and heart-felt message on each one (no joke–she really wrote nice things), and one of us got to lick the envelope and stamp. Frankly, I’ve always liked the taste of envelope glue. I’m one of those who doesn’t send cards anymore. I have a bunch of excuses–the cost, the protection of the environment, I didn’t have a decent photo with the boys and Roger, no time, whatever. Yesterday, Roger sent The Yule Log a link with 10 free e-cards. At first, I was just going to take a look, no commitment. I have to investigate what I will be writing about. Then, I was hooked. I sent e-cards to everyone. FREE is a good incentive. Also, one two of the sites, I didn’t even need to create an account. My favorite for the music, interactive card is the free e-cards from Hallmark. I sent that one to Denise because it was very sentimental, and she used to cry at the drop of a hat. She has followed The Yule Log 365 for nearly 365 days, so she deserves my marginal effort at a Christmas card. Hallmark made me sign up to send the card, and when I went back to the site, I couldn’t find the FREE ones any more. It was only cards with a $12 subscription. But $12 for a whole year is pretty affordable. The most clever FREE card came from PINGG–it’s a Christmas pie chart. This is a site similar to EVITE. I had to sign up for this site, too. After the initial sign up, I could use the site to send invitations as well as cards. I also sent a FREE card from Punchbowl, another site that has options for party planning and more. This card had a digital envelope with a digital stamp. The stamp was customizable. I figure if the sender gets caught up in the customizing a digital stamp, then that borders on obsessive. The 3D card I sent from Jimpix was pretty cool–no sign up. That’s a bonus for this lazy girl. The type swirled around with metallic shimmer. I sent Roger a card from someecards because the message on the card was snarky and about marketing. When a woman sends her husband an ecard for any other reason than blog research, that’s a little odd. Hipstercards.com was straight up easy. The cards are simple and cute. I didn’t have to make an account. I fail in the area of knowing what a “hipster” is, but the card was fun a clever. Overall, I think I’d send cards from that site again. If you made it this far in the blog, you’ll probably send an e-card or two of your own. If that’s your plan, send one to theyulelog@gmail.com. Would love to hear from you digitally! In our urgent efforts to prepare for Hurricane Sandy, Roger and I went to the grocery store to buy flour (for waffles), bacon, and ice cream. 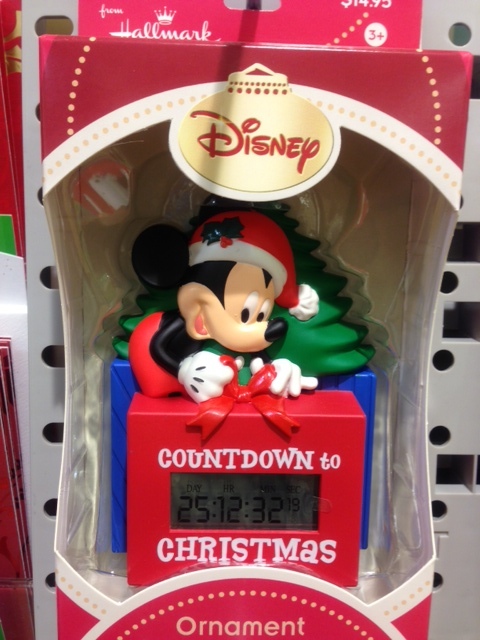 As we were bustling down my the aisle with Thanksgiving and Christmas cards, I spied a Disney Countdown to Christmas ornament. As Jeremy and I have spent an entire year counting down, this looked like a great stocking stuffer–although it would be more suitable for Thanksgiving party favors. Another item on the rack above the Christmas cards was a Christmas Merry-Okee. This is a microphone with six pre-recored holiday songs and a songbook with original and silly lyrics. 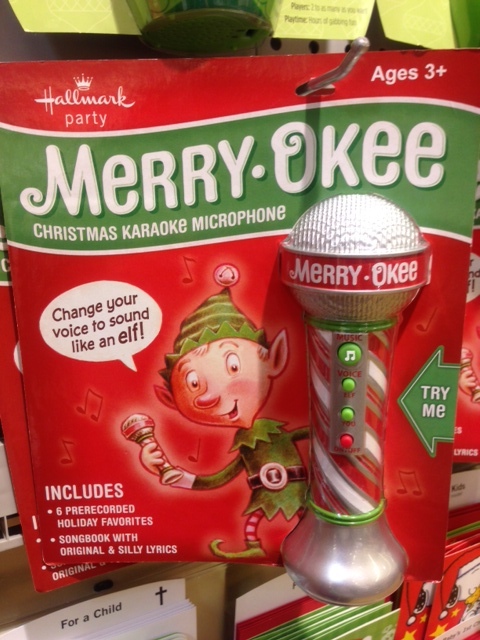 Children (and goofy adults) can sing into the microphone, and the sound is transformed to sound like an elf. I think that my grandson would LOVE this toy–and it seems like it would be an excellent children’s party toy. 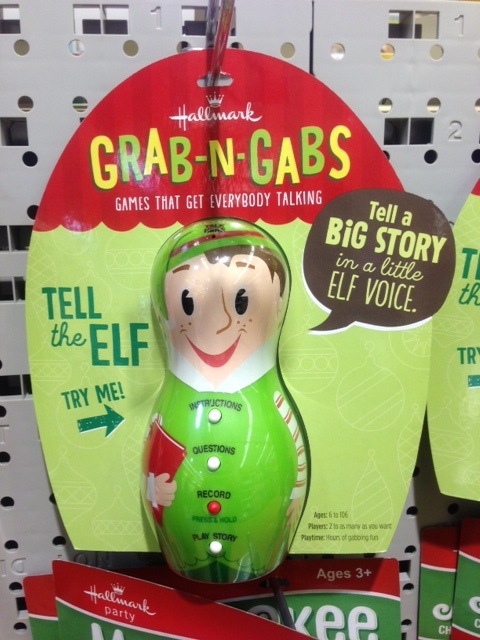 A third item, is a Grab-N-Gabs Elf. In this case, it’s like the old Mad Libs. The child (or adult) records answers the elf’s questions. Then the elf tells a story, inserting the funny answers. I liked Mad Libs as an elementary school student, so I can see this appealing to the elementary set; however, I saw a YouTube video where the young person was playing with the Grab-N-Gabs, but the humor came using inappropriate words. That’s always a side effect Mad Libs. My least favorite of Hallmark’s offerings is the Jolly in the John Snowman (on the heels of the Jokin’ in the John Ghost). In this case, when the Snowman senses motion, he speaks one of four phrases. I feel that there are plenty of items for the bathroom that are seasonally appropriate–star-shaped soap, pine scented candles, snowman and Christmas tree-ceramic soap trays, patterned towels and more. 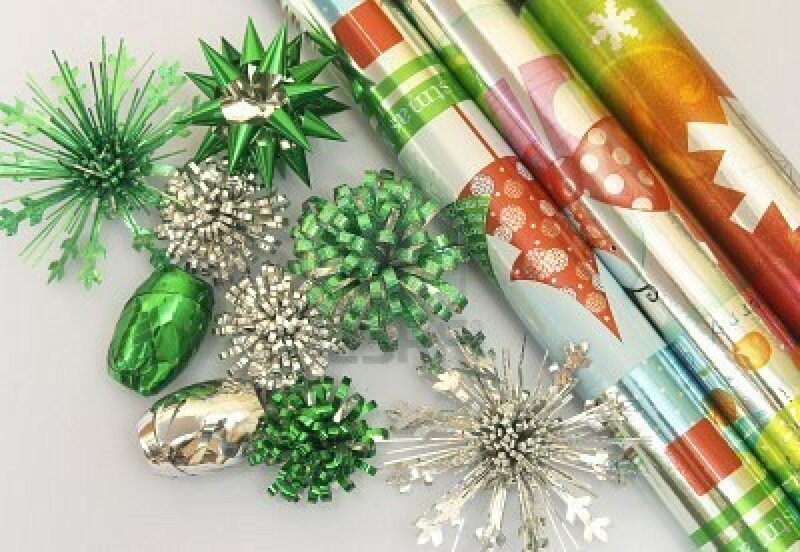 I might even give in to holiday printed toilet paper. I don’t need a talking snowman, though, to interrupt my privacy. Yesterday, I spied the Hallmark store window in Ellicott City advertising the Keepsake Ornament Premiere planned for July 14–only one day away! I decided to explore the world of Hallmark collectible ornaments, so I slipped into the Eldersburg Hallmark store this afternoon. As far as a celebration goes, I must have missed the morning rush, but there was a nice display of cookies, candy and juice. I spend some time wandering along the wall of ornaments, grouped by theme, including a modern movie theme with an ornament of Baltimore Raven 74 Michael Oher featured in the movie, The Blind Side. I was drawn to the wedding couple dancing, until I realized it was from Twilight teen sensation, Breaking Dawn. There were plenty of my favorites from cartoons, including a terrific holiday Yosemite Sam. Many of the ornaments had sound or light. The dog ornament might have been my major purchase of the day until I pressed the button and it played the “Jingle Bells” recording of dogs barking. No one needs to hear than more than once. 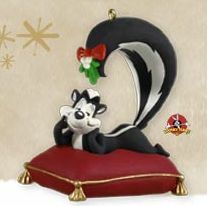 Pepe le Pew is on a red pillow with his tail curved over his head so that he is perpetually under mistletoe. Now that’s clever. The ornament is called: Merry Kiss-Mas. There’s a cool Harley Davidson motorcycle that I understand is the fourteenth in the series. I’m not interested in motorcycles, but my son is, and this would be a perfect gift that could become a collection. There’s a whole Star Wars series! Believe me, there is something for everyone on your Christmas list. The prices range from $15 – $40–that’s too high a price to pay. However, I almost joined the Keepsake Ornament Club because new membership ($25) gets two of the three membership ornaments–a $40 value. After joining, members have access to additional members-only ornaments, like a beautiful Barbie in a black evening gown (available this weekend only). I came away empty-handed but convinced that I could start a new ornament tradition for some of my family members. Podcast #24- 188 Days to Go! Podcast #24- Click here to listen to this week’s podcast- Christmas Collectibles! This week we try our first “remote” podcast. Remote meaning that we are recording without both being in the studio. The results aren’t our usual quality recording but it’s still great. We begin our collections and collectibles week with our discussion. Natalie and I discuss our introductory searches into the world of Christmas collectibles. 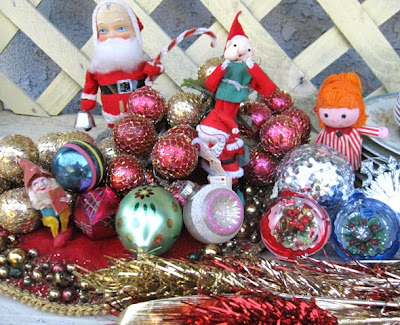 This included ornaments, figurines, displays, plates, and creches. Hummel, Coca-Cola, Precious Moments, Avon, Swarovski, and Hallmark Keepsakes are part of our talk. We plan to get more into the fine differences between collecting regular Christmas things and buying things marketed as collectors’ items. Stay tuned this week for more details about our quest. 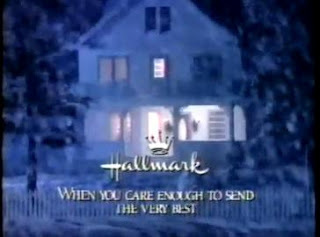 After I posted about Hallmark card commercials on Super Bowl Sunday, faithful listener Denise Reynolds sent me a link to a 1999 Hallmark Commercial about a young woman who joins her new husband’s family for Christmas. It’s her first holiday away from home. By the middle I was sobbing. Valentine’s Day is just around corner, and this February holiday reminds me of couples and love and how difficult and stressful it can be for new marrieds (or newly engaged couple) to fit in to the established Christmas traditions. In our family, we attend Christmas Eve Mass together, and every member of the extended family—infant to grandparent—participates in the Mass. Even pew-warmers must supervise wiggly shepherds and angels. 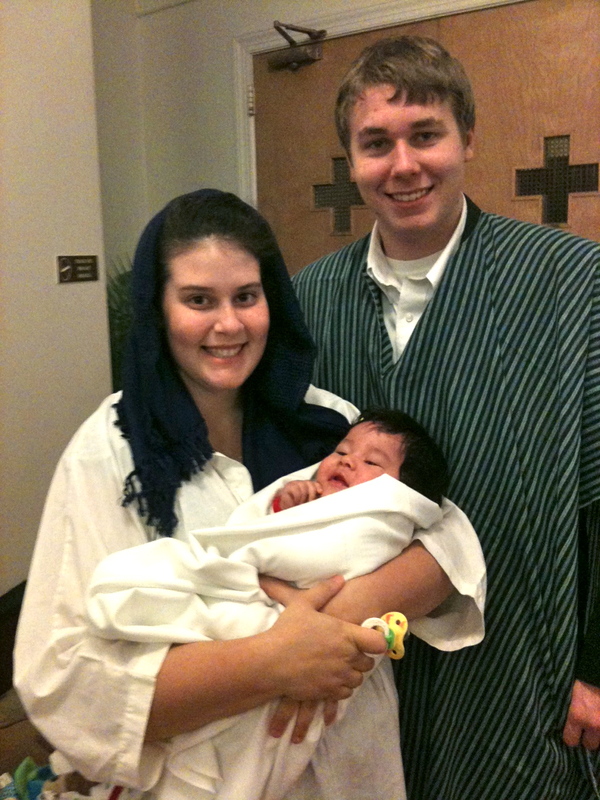 My son, Ian, was the first live Jesus in the Gospel reading and pageant more than two decades ago, but we have been a part of the mass for years before that. So, any new member must pass the family test of attending and participating, as instructed by Director Grandma Shirley. That’s a lot of pressure for a newly engaged young man or woman in our family. We break them in slowly—in the early years, they hold a candle in the procession and stand in reverence around the Holy Family. Baby Jesus comes later, obviously. In our podcast this week, we’ll be talking about engaged and newly marrieds and the best strategies for managing the holiday family obligations. In the week before the Super Bowl XLVI, Roger and I watched a special about Super Bowl commercials and previewed some of them, including Anheuser Busch, Coca Cola, Smyth and more. Roger was literally guffawing at the screen and was a wee bit miffed that I don’t have enough of a sense of humor to laugh, too. At Christmas, I grew up with the Hallmark Hall of Fame Christmas specials, which began in 1951 and continued through my childhood when there weren’t more than two or three channels to choose from. The feel-good movies included now-famous the Hallmark card commercials. As much as Roger laughed this week, I sobbed then through the saccharin card-giving moments. In fact, they made me cry so much that I would turn them off rather than watch. I checked out some of the most popular Hallmark commercials on YouTube and found myself crying again! I’ve included a link to one of the best, the 1990’s commercial where the little brother waits for his big brother to come home. I warn you: get out the tissues! Let us know your favorites. We’ll post them here.